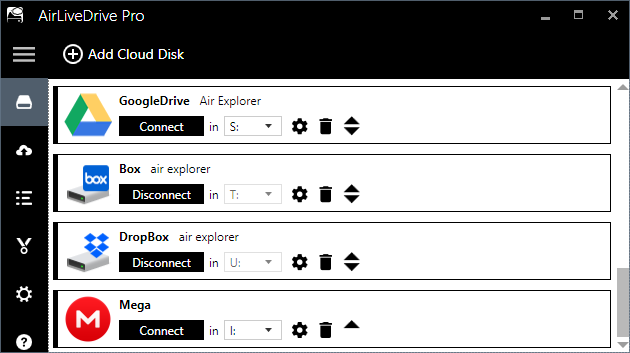 Add your clouds as disk drives to your computer. Air Live Drive 1.1.3 was available as a giveaway on October 24, 2018! !! !The registration data is in the Readme file in the download package!!! How would you improve Air Live Drive 1.1.3? add Custom/User Defined drive profiles. I've had this for a while. My main reason for getting it was that I waned to upload a couple of quite large backup files without having to put them in (or under) my Dropbox folder. For those unaware, Dropbox is very stunted in that it only allows files in or under ONE folder to by synced to the cloud. There are weak workarounds, and there is also a single expensive third party utility is available to fix that. The software 'caches' (large?) uploads, dumps them onto the boot SSD, then sits on them for a very, very long time. In the meantime, it managed to raise the temperature of my m.2 boot SSD from around 42C to 65C. When I killed the process, the temp dropped back down. I was unable to find a way to just have it upload the file, and the web site and help function give new meaning to the word 'sparse'. I've had this for a while. My main reason for getting it was that I waned to upload a couple of quite large backup files without having to put them in (or under) my Dropbox folder. For those unaware, Dropbox is very stunted in that it only allows files in or under ONE folder to by synced to the cloud. There are weak workarounds, and there is also a single expensive third party utility is available to fix that. So I installed this about a month ago, and with little to no help to go by, started a 110GB file upload to a Dropbox subfolder I created, and here's what happened: The software 'caches' (large?) uploads, dumps them onto the boot SSD, then sits on them for a very, very long time. In the meantime, it managed to raise the temperature of my m.2 boot SSD from around 42C to 65C. When I killed the process, the temp dropped back down. I was unable to find a way to just have it upload the file, and the web site and help function give new meaning to the word 'sparse'. DD, eek sounds like they cache the file being uploaded to the systems or user accounts TEMP folder which by default is on the system drive... gross mistake in my opinion it's doing the exact thing it calims is its USP... it's supposed to be avoiding making local coppies of cloud backuped files! I'll wait until they figure out how to do what they claim properly and cease stressing drives with pointless files copying to what is often nowadays a smaller SSD system drive from a larger magnetic secondary drive. Simply copy those files to your local Dropbox folder and the Dropbox local app will upload it. The downside that Dropbox doesn't allow multiple local folders to be synces can very easily be solved by using hard links. Using a program like offered here isn't a solution at all for this. That's the completely wrong program for that. DD, You want to upload files to Dropbox, but don't want the files in/under the Dropbox (folder).... Maybe I misunderstood but that makes no sense at all... If you want to upload a file to dropbox, then you need to upload it to.. errmmm... dropbox... Simply copy those files to your local Dropbox folder and the Dropbox local app will upload it. The downside that Dropbox doesn't allow multiple local folders to be synces can very easily be solved by using hard links. Using a program like offered here isn't a solution at all for this. That's the completely wrong program for that. TK, yes, that's exactly what it feels like they are doing. While I'm kind of sort of OK with them temporarily storing a file on the boot SSD (that fits) while they upload it in pieces, raising the temp of my M.2 boot SSD to within 5 degrees if its unhappy place and holding it there is unacceptable. It has never gotten anywhere near that hot in the year it's been installed. Additionally, the files I'm interesting in uploading and storing without syncing are about 120GB each. What happens if they don't fit on the SSD? What does it do then? And to reply to Oscar, you clearly didn't understand what it was I'm trying to accomplish. I'm paying Dropbox $100/year for 1TB of storage, and currently using about 10% of that. I want to upload about 1/4 TB of backup files without having them on my boot drive and without having them sync. Just store them on Dropbox. This software seemed like the ideal way to do that until it did a bunch of unexpected things. TK, yes, that's exactly what it feels like they are doing. While I'm kind of sort of OK with them temporarily storing a file on the boot SSD (that fits) while they upload it in pieces, raising the temp of my M.2 boot SSD to within 5 degrees if its unhappy place and holding it there is unacceptable. It has never gotten anywhere near that hot in the year it's been installed. Additionally, the files I'm interesting in uploading and storing without syncing are about 120GB each. What happens if they don't fit on the SSD? What does it do then? And to reply to Oscar, you clearly didn't understand what it was I'm trying to accomplish. I'm paying Dropbox $100/year for 1TB of storage, and currently using about 10% of that. I want to upload about 1/4 TB of backup files without having them on my boot drive and without having them sync. Just store them on Dropbox. This software seemed like the ideal way to do that until it did a bunch of unexpected things. DD, I had a similar issue regarding onedrive on my new SSD + magnetic hard drive laptop where onedrive was factory installed onto the smaller SSD... I just moved the folder over to the other drive in my other hacking to move over various frequently written to heirachies over. But I cannot transfer files across clouds w/o downloading and uploading to/from my PC... O the shame of that. It is very logical that that is not possible if you think about it. When you want to transfer, where does the data needs to go? It always have to go thru your own computer, before it can be uploaded to the other cloud service. So, no local program wil be able to do that without storing the data somewhere locally (physically on your disc, or in memory). Only, and only(! ), if said cloud services support up or downloading from other cloud services _directly_ using their own temporary storage, something like that might be possible to do/initiate from a local running program. Cary, It is very logical that that is not possible if you think about it. When you want to transfer, where does the data needs to go? It always have to go thru your own computer, before it can be uploaded to the other cloud service. So, no local program wil be able to do that without storing the data somewhere locally (physically on your disc, or in memory). Only, and only(! ), if said cloud services support up or downloading from other cloud services _directly_ using their own temporary storage, something like that might be possible to do/initiate from a local running program. Puzzling how this can be for non-commercial use only if it allows you to connect to OneDrive for BusinessPuzzling how this can be for non-commercial use only if it allows you to connect to OneDrive for Business. Kevin M Maloney, 'non-commercial use' is a common statement in all GOTD offers. As for this particular one, please contact the developer. Kevin M Maloney, 'non-commercial use' is a common statement in all GOTD offers. As for this particular one, please contact the developer. We apologize for inconvenience. I have a desktop and laptop. Will one registration work on both? Is the lifetime license for 1 computer only? I have a desktop and laptop. Will one registration work on both? Is the lifetime license for 1 computer only? 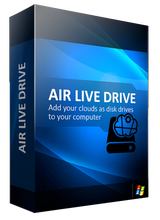 Get all the features of Air Live Drive in the pro version for one year or lifetime (1 licence per device). Not such a good deal if I have to pay 2, 3, or 4 times. One time per device. I don't see the Amazon Drive listed. Is this just an omission from the list or does it not support Amazon Drive? And you can also suggest other cloud services to be added. John, It support plugins apparently. And you can also suggest other cloud services to be added. I was looking at their other product "Air Explorer" which does support plugins. But also supports Amazon Cloud Drive already. John, Ignore my previous comment. 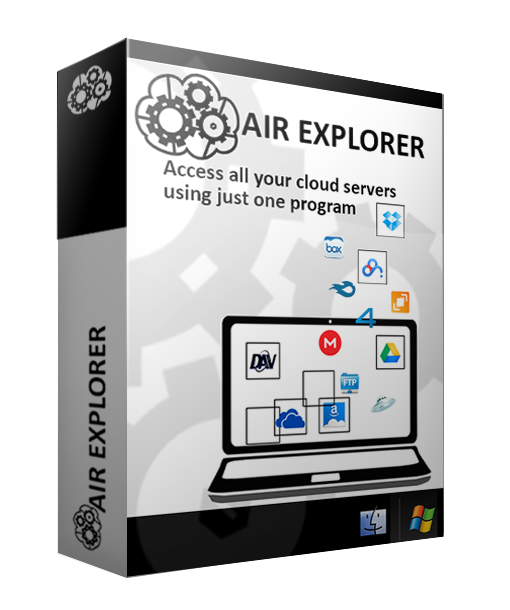 I was looking at their other product "Air Explorer" which does support plugins. But also supports Amazon Cloud Drive already. it's the only thing that's changed. files from any other site on the internet. Karel, try clearing/cleaning your browser. I might contain remnants of the DSL service that is no longer available. Or try another browser. My favourite is Vivaldi. Karen Stavert, Can you download from other sites? if so, try using a different browser. If all else fails, power off your pc, modem, router, everything - wait a few minutes, then power all back on. i've rebooted my PC a bazillion times..
the ONLY difference is our wifi. jj juice, i've rebooted my PC a bazillion times.. It is strange: switching the way of contact the internet and no GOTD. All the other sites are OK? Like Krypteller say, clear a lot of things, also cookies of GOTD. DNS: maybe you DNS of your IP-connection can be a problem. I do know a someone: he did get a new ISP and it was slow, very slow. I altered the DNS of the network-card and after that is was much better. Sometimes you can change it in the router itself. Ok, if you want- let's do some troubleshooting. First- do you mean *downloading* or *installing*? And then, next question- what happens. "Nothing" isn't the best answer. Be as specific as possible. Karen Stavert, Ok, if you want- let's do some troubleshooting. First- do you mean *downloading* or *installing*? And then, next question- what happens. "Nothing" isn't the best answer. Be as specific as possible. Just go to our home page and proceed from there. Moderator no need to be concerned about me handing out a real giveaway URL it is old and edited the hash is not the same as the original and neither is the file name so should be no problem publishing it. Karen Stavert, have you tried the following? Karen Stavert, have you tried the following? netsh int ip reset c:\reset log.txt netsh int ip reset ipconfig /flushdns netsh winsock reset (and restart the computer) netsh int ipv4 reset netsh winsock reset catalog netsh int tcp set heuristics disabled netsh int tcp set global autotuning level=disabled netsh tcp show global ipconfig /release ipconfig /renew Best to run these commands as administrator: press Windows key + R cmd.exe followed by Ctrl-Shift-Enter, or click-right and choos run as admi Good luck! Could it be that with your new internet-connection you get a "free" anti-virus program that blocks GAOTD? I am not referring to a program which needs to be installed on your PC perse, rather, some isp's have a AV on the server side. Check with the isp. Karen Stavert, Could it be that with your new internet-connection you get a "free" anti-virus program that blocks GAOTD? I am not referring to a program which needs to be installed on your PC perse, rather, some isp's have a AV on the server side. Check with the isp. karen, is there a difference between direct downloading and downloading by the link, after you ask for a mail to download it? Yours looks very different with that 'files3' prefix. Are you on a work computer that might have security software that would change the link? Maybe try to enter the link manually? That's a pain, I know, but something to try if you really want to figure it out. Lastly, maybe try in incognito mode? That's about all I got at the moment. GAotD has a lot of steps to actually get the link. Log in w/either FB or email, get a link one of those ways, etc. That link you displayed, is it from a GAotD email? What were the steps you took? karen, Huh. well, it's hard for me to troubleshoot because there's a couple different ways to get the link (logging in through FB or using email). So not quite sure what exactly you see. Looking at the link I got yesterday through email, it looks like this: https://www.giveawayoftheday.com/download/?c=930410292df3...(really long hash number you don't need) Yours looks very different with that 'files3' prefix. Are you on a work computer that might have security software that would change the link? Maybe try to enter the link manually? That's a pain, I know, but something to try if you really want to figure it out. Lastly, maybe try in incognito mode? That's about all I got at the moment. GAotD has a lot of steps to actually get the link. Log in w/either FB or email, get a link one of those ways, etc. That link you displayed, is it from a GAotD email? What were the steps you took? that i have problems with. J, The links we get for personalised download links via email are processed server side and are transformed several times and end up as the link style I posted http:// as opposed to https:// too. Karen , the links I gave were examples of the style you get that fail and how to edit said link to possibly create a workable link if my hypothesis of the problem is correct. The links I posted themselves in original and edited form WILL NOT WORK as A) they are from a long expired giveaway and B) both the file name and the hash were edited from the originals to ensure that no reverse engineering of the giveawayoftheday.com downloads authentication could take place. You must take the URL presented by YOUR browser on the Oops 404 page address bar and edit it to an https:// based URL rather than the http:// URL you should find there. Of course no warranties expressed or implied it's just a logical deduction and possible solution if the deduction was right. Karen , the links I gave were examples of the style you get that fail and how to edit said link to possibly create a workable link if my hypothesis of the problem is correct. The links I posted themselves in original and edited form WILL NOT WORK as A) they are from a long expired giveaway and B) both the file name and the hash were edited from the originals to ensure that no reverse engineering of the giveawayoftheday.com downloads authentication could take place. You must take the URL presented by YOUR browser on the Oops 404 page address bar and edit it to an https:// based URL rather than the http:// URL you should find there. Of course no warranties expressed or implied it's just a logical deduction and possible solution if the deduction was right. Do i have to keep the desktop apps open - like dropbox or google drive = in my taskbar in order to use this tool? Antonio, You can easily add an exception to antivirus programs/firewall so they won't scan what you don't want scanned. So this is not an issue at all. 1) is indeed a small issue (but not this program's fault). You can either disable the creation of thumbnails, or let it create the thumbnails and make sure you don't remove the thumbnail file/storage. 2) certainly not this program's fault, and easily solved by disabling that in your virus scanner for those drives/folders. 1) is indeed a small issue (but not this program's fault). You can either disable the creation of thumbnails, or let it create the thumbnails and make sure you don't remove the thumbnail file/storage. 2) certainly not this program's fault, and easily solved by disabling that in your virus scanner for those drives/folders. tom, not all user have the knowledge to understand this issue and fix this, this program must, at least, give some hint about how to use it the good way, helping the users to fix this issues. No tips/hint at all in the program. Myself i already added exception to antivirus and set the directory and sub-directory as "document" in windows, so will avoid create thumb by default in directory with images/videos. Im not 100% sure, maybe the devs can set it tho be the default when create the virtual drive in windows. I would have liked at least the devs to respond here about this kind of issue, sadly, no response at all. tom, not all user have the knowledge to understand this issue and fix this, this program must, at least, give some hint about how to use it the good way, helping the users to fix this issues. No tips/hint at all in the program. Myself i already added exception to antivirus and set the directory and sub-directory as "document" in windows, so will avoid create thumb by default in directory with images/videos. Im not 100% sure, maybe the devs can set it tho be the default when create the virtual drive in windows. I would have liked at least the devs to respond here about this kind of issue, sadly, no response at all. So after 1 year does it stop working? Worth it. Bought it. Has access to so many different services. I don't usually buy something right out of the gate on GOTD, but this one works and it works great. There are other solutions out there, but they don't allow access to places like Mega and Mediafire like this one. Those two sold me on it. Di, I completely agree with you. I also bought a unlimited license with 50% discount, based on your comment and I don't regret it at all. Wolf, how to get 50% discount? See their website. Mac version is available. when I click on one drive, I see all the files in file explorer as a file folder......I have one cloud...…….and then? do I need this program?.....in file explorer I always see one drive as a file...……..with this program the feature is duplicated as a drive, and open up the files; and under properties I can see how much storage space...……...I can see if you have multiple accounts this might be nice...……...any other advantages? for instance explain to me the one about saving space; am I not saving space with onedrive? you're (can be) saving space because not all the files in the cloud t need to be downloaded, to see or use them. Only the file you want to use (eg: opening a Word document in Word) will be (needs to be) downloaded. The other files you'll see listed in Windows Explorer, just like on any other (local) HDD, but they don't necessarily need to be downloaded. Also note that you don't need the specific Cloud apps to be running (which do require all those files to exist locally too). As such, you save space because all files stay in the cloud (until you 'open' one of them... then that one needs to be -temporary- downloaded). George James james Ducas, you're (can be) saving space because not all the files in the cloud t need to be downloaded, to see or use them. Only the file you want to use (eg: opening a Word document in Word) will be (needs to be) downloaded. The other files you'll see listed in Windows Explorer, just like on any other (local) HDD, but they don't necessarily need to be downloaded. Also note that you don't need the specific Cloud apps to be running (which do require all those files to exist locally too). As such, you save space because all files stay in the cloud (until you 'open' one of them... then that one needs to be -temporary- downloaded). This works GREAT. Thanks! I have it connected to several cloud storage services I subscribe to. One nice bonus, if you have several of the SAME cloud account (I have a family plan with OneDrive that gives me 5-1TB accounts), you can have them ALL in one place. Makes it VERY convenient. I had just been trying a demo of a different product that works similar to this, so this just saved me some money. If you have any cloud storage accounts and want to access them as a local drive folder, this is perfect. Thanks again! All Clouds can be accessed by more than 1 program, so the limitation of the 1-year license will not be a problem. p7HQGZr4.htm but no page opens up and no prog downloads? For some reason I cannot download. I click on the link/button and nothing happens . Link is supposed to be p7HQGZr4.htm but no page opens up and no prog downloads? "Use your usual tools or programs directly on the files in the cloud." What does Air Live Drive want to achieve? That everyone parks their programs and documents in the clouds? That one only has an OS on a computer and nothing else? Is that what is called evolution? Do you have nothing more to say about your own PC? Weird condition is that! "Use your usual tools or programs directly on the files in the cloud." What does Air Live Drive want to achieve? That everyone parks their programs and documents in the clouds? That one only has an OS on a computer and nothing else? Is that what is called evolution? Do you have nothing more to say about your own PC? Weird condition is that! Jean Baljuw, I think you completely misread that description and the point of this program. It states "...._ON_ the files in the cloud". Which means any LOCAL tool or program will see the files in the cloud as if they are on a normal (local) HDD. Jean Baljuw, I think you completely misread that description and the point of this program. It states "...._ON_ the files in the cloud". Which means any LOCAL tool or program will see the files in the cloud as if they are on a normal (local) HDD. Let's say I have a GDrive account. Let's say I'm working on a Word doc and want to save it to drive. Normally, I'd have to: Save it to the desktop, open Chrome, open Drive, log in, click-drag my file over to GDrive. With this program, I just: Click save (or save as, depending), then GDrive will be among my list of places to save. Just like- Desktop, documents, my E/F/G drives, etc. 1-2-3. Then to open that Word doc, I might be able to do it straight from "My computer". I won't have to open chrome, go to GDrive, log in, click-drag the file over to my pc. And so on. Pretty handy, if you ask me. One of the programs does this already. One Drive I want to say. But to have the others would be great! Jean Baljuw, Yeah, I agree with Oscar, I'm not sure where you're coming from. I read this program to do this: Let's say I have a GDrive account. Let's say I'm working on a Word doc and want to save it to drive. Normally, I'd have to: Save it to the desktop, open Chrome, open Drive, log in, click-drag my file over to GDrive. With this program, I just: Click save (or save as, depending), then GDrive will be among my list of places to save. Just like- Desktop, documents, my E/F/G drives, etc. 1-2-3. Then to open that Word doc, I might be able to do it straight from "My computer". I won't have to open chrome, go to GDrive, log in, click-drag the file over to my pc. And so on. Pretty handy, if you ask me. One of the programs does this already. One Drive I want to say. But to have the others would be great! J, A quick way to access GDrive is to use a ChromeBook - as soon as the Internet is connected, GDrive is 1 of the default options. I will say so. Can you work on PCs without World Wide Web? We are too dependent on others. You can say that this is an army mentality. "You must not think, we think in your place!" Stand up for your own interests and do not go too far ahead of what others are chewing for you. No dropbox or clouds for me and certainly as few accounts as possible at companies. Oscar and J. I will say so. Can you work on PCs without World Wide Web? We are too dependent on others. You can say that this is an army mentality. "You must not think, we think in your place!" Stand up for your own interests and do not go too far ahead of what others are chewing for you. No dropbox or clouds for me and certainly as few accounts as possible at companies. Oscar, except for one thing for windows to open and edit a cloud file it will have to be downloaded locally and there are MANY parts of windows that will prompt a download from the clouds server to get at the details like creating thumbnails or displaying executables icons or their extended version attributes or your AV program wanting to scan the files before windows can process the icons or generate the thumbnails and IF they have to be downloaded they have to go on to some local storage as we do not have infinite RAM to cache files... I believe this gives us an illusion of drives letters when really it's just cacheing the real files in the TEMP folder usually on the system drive which is the last place where you want the files placed on SSD based computers. 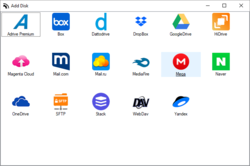 J, has google stopped supporting the google drive client program that you can just use as a folder or tree of folders on your computer? It seems I can still download it from googles website... using google drive via a web browser alone seems like shooting yourself in the foot to treat a blister. Ok, now I get it. You're just saying- "don't use cloud services, keep your property on your computer". Yeah, I agree with that, but there are times when it comes in handy. I have a lot of photos I want to share with people. On G/drive I can upload them and get a link to give to friends. I'm not going to use Facebook or whatever, because of the "army mentality" that you're talking about, and not all of my friends are on Facebook. Sometimes I may want to have access to files when I'm traveling. I could put them on a flash drive, or I could put them on the cloud and access them on the road. There's lot's of reasons to use these services without 'signing your life over to cloud services'. And honestly- the world is already very very connected. Did you make your own clothes? Grow your own food? No, you rely on other people to do that for you. You went to a store and bought them. Someone made the bags you carried them home with. The world is very inter-connected. Jean Baljuw, Ok, now I get it. You're just saying- "don't use cloud services, keep your property on your computer". Yeah, I agree with that, but there are times when it comes in handy. I have a lot of photos I want to share with people. On G/drive I can upload them and get a link to give to friends. I'm not going to use Facebook or whatever, because of the "army mentality" that you're talking about, and not all of my friends are on Facebook. Sometimes I may want to have access to files when I'm traveling. I could put them on a flash drive, or I could put them on the cloud and access them on the road. There's lot's of reasons to use these services without 'signing your life over to cloud services'. And honestly- the world is already very very connected. Did you make your own clothes? Grow your own food? No, you rely on other people to do that for you. You went to a store and bought them. Someone made the bags you carried them home with. The world is very inter-connected. Does Gdrive have a client program? I never knew that, never heard of it. But anyway, that's just GDrive, what about the others? I kind of like having access to many of them all through one interface/application. I can use them for different purposes- Work requires one, my personal use another, I have all these new ones I've never heard of but am interested in because anything that's not Google is a plus. "Shooting yourself in the foot to treat a blister" seems dramatic, lol... I'd say just 'taking the long way around'...And like I said, I never knew there was an interface. TK, Does Gdrive have a client program? I never knew that, never heard of it. But anyway, that's just GDrive, what about the others? I kind of like having access to many of them all through one interface/application. I can use them for different purposes- Work requires one, my personal use another, I have all these new ones I've never heard of but am interested in because anything that's not Google is a plus. "Shooting yourself in the foot to treat a blister" seems dramatic, lol... I'd say just 'taking the long way around'...And like I said, I never knew there was an interface. J, yes Google has pretty much always had the client side program I am surprised anyone especially users of google drive could avoid seeing it! Jim B, The point of the software is basically easy access. a centralized location for all your cloud storage. Just a quick glance comment before testing. Doesn't windows 10 do this & similarly within file explorer? John, your comment is very interesting, but I will give it a try to find any difference. I think it does it with OneDrive. But I don't think it works with the others.... OneDrive is Microsoft, so it makes sense. And even then, I think/want to say that OneDrive still has a storage area on the local Pc that it just syncs with actual cloud storage. So you're still using PC disc space. Not 100% sure on that. John, I think it does it with OneDrive. But I don't think it works with the others.... OneDrive is Microsoft, so it makes sense. And even then, I think/want to say that OneDrive still has a storage area on the local Pc that it just syncs with actual cloud storage. So you're still using PC disc space. Not 100% sure on that. A George, I figured as much. 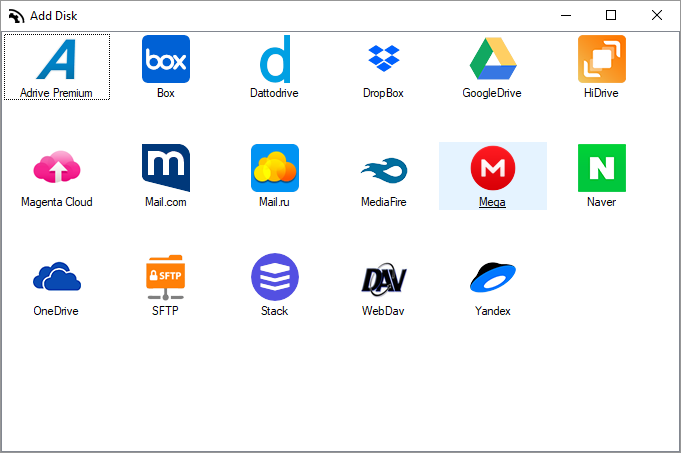 i had a look at it myself and noticed Dropbox and Mega are seen as disks and you are able to use Onedrive & Google drive in the same manner. Granted some may require the desktop app counterpart but not all. All of which these at least integrate into file explorer which for the average user iss very handy. 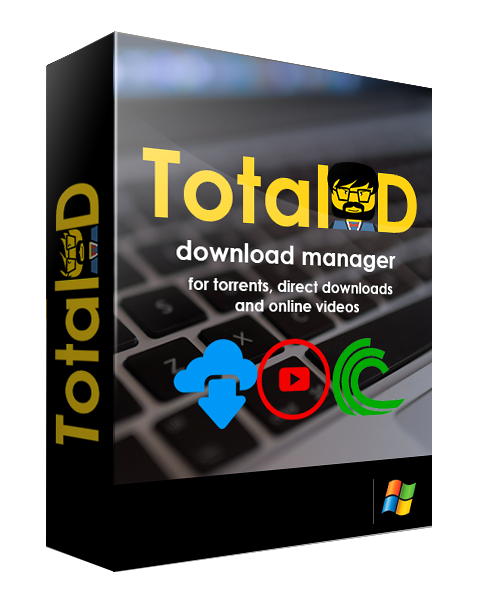 I can't see myself using this software as i don't want to shell out in a years time for the product that i wouldn't fully utilize, I have external drives i use for this purpose. Thank you developers & GotD but i shall pass today. John, ..... but i shall pass today.....That is at least clearly spoken!